The shoe provides amazing step-in comfort, according to many. Majority of the users just love the feel of Boost on their feet. Many wearers remark that these Adidas basketball shoes fit true to size. Most reviewers report that the Crazy Explosive Low has excellent traction. Like the Nike PG3, some observe that the Adidas Crazy Explosive Low feels lightweight and is breathable. The sneakers look good and have cool colors, several said. A few mention that the shoes can be worn casually. Several wearers note that the mesh upper feels soft. It does not crease and doesn’t need any break-in time. The shoes provide good support for a low-top model, a good number observed. Almost all users give the Adidas Crazy Explosive Low a high satisfaction rating. Most testers noted that the Adidas Crazy Explosive Low is strictly for indoor courts. The mesh upper and outsole aren’t durable. Players are having the same issue with Curry’s 6th shoe from Under Armour. Some say the shoes run small and narrow, while others say they run large and wide. A few wearers experience some toe jamming and heel slippage during play. A handful complained that the laces easily come undone. These Adidas shoes are not comfortable to play in, a few commented. A small number report that the traction loses its grip on dusty courts. Performance-wise, nothing has changed. What you’ll get is the Crazy Explosive Mid performance in low-top form: great step-in comfort, impact protection, traction, responsive Boost cushioning, and solid support. As with the mid-top model, the shoe’s durability could have been better. Retailing at $120 (textile version) and $140 (Primeknit version), the Adidas Crazy Explosive Low is a must cop. It’s an all-in-one low-top package that gets the job done. You aren’t giving up anything by going with the Crazy Explosive Low. This thing is just amazing. It’s no brainer – the adidas Crazy Explosive is the best basketball shoe right now and with $120 price tag you really can’t beat them. Prepare to take off with the Adidas Crazy Explosive Low. Get the explosive power you’ll need with every block, steal, and run-out dunk. These basketball shoes are cut low for speed and have a padded collar for stability. The Crazy Explosive Low features full-length Boost for responsive energy, a TPU roll cage to withstand pressure when advancing hard to the basket, and coral constructed power traction for commanding grip. Cushion. The Adidas Crazy Explosive Low features a full-length Boost midsole. Boost is Adidas’s most responsive cushioning ever. Its energy-returning properties keep every step charged with an endless supply of light and fast energy. A TPU roll cage wraps the midsole while Infinity-shaped shanks provide additional midfoot stability. Traction. The Adidas Crazy Explosive Low has a grippy rubber outsole that wraps up and around the midsole for added traction. The coral power traction pattern delivers natural court feel and commanding grip on any surface. Length and Width. The Adidas Crazy Explosive Low gets mixed reactions about its fit. Buyers are recommended to try the shoes before purchase. Lockdown. The Adidas Crazy Explosive Low uses dynamic lacing with a single-piece upper for uncompromised fit, lockdown, and stability. The anatomical lace system wraps the entire foot, relieving pressure. A molded heel lace system, padded collar, and an internal heel counter ensure a locked-down fit. The Adidas Crazy Explosive Low features a four-way-stretch upper with raised puff print. This material delivers lightweight support, comfort, durability, and a snug fit. A Primeknit upper is also available. Primeknit provides premium comfort, fit, and breathability. The low-top design of the Crazy Explosive allows for enhanced ankle mobility and doesn’t add bulk so you can cruise at top speed. With a more traditional silhouette and an assortment of tonal colorways constructed of textile and Primeknit uppers, the Adidas Crazy Explosive Low is designed for on and off the court. 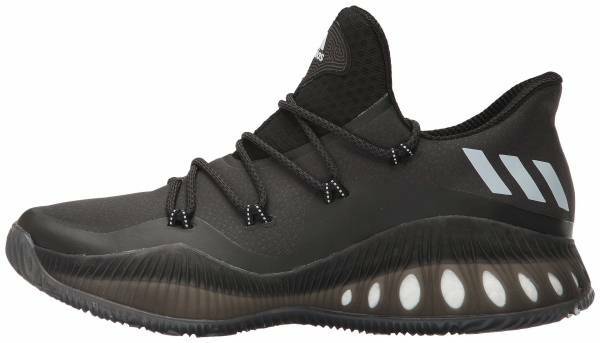 Following up on the success of the Crazy Explosive, Adidas Basketball has released an all-new Low silhouette. The Crazy Explosive Low is a refined version of its predecessor, and its design focuses on functionality. The shoe pairs premium technology with unique design elements for a progressive approach to style on and off the court. The Crazy Explosive Low is what Adidas was missing in its basketball division. Powerful and explosive players like Andrew Wiggins, Nick Young, Iman Shumpert, and Brandon Ingram have been craving a lightweight low-top shoe that doesn’t compromise their ankles. With full-length Boost, the Crazy Explosive features more Boost technology than any other Adidas basketball shoe. Adidas released a variety of colorways for one of their most popular basketball sneakers. Adidas Consortium launched the ‘Day One’ collection in spring/summer 2017. The collection includes two lifestyle-inspired versions of the Crazy Explosive Low that feature a combination of black and white hues. As a show of support to the LGBTQ community, Adidas released their Pride month collection that includes rainbow-themed versions of the Adidas Originals Superstar, Ultraboost 3.0, EQT Support ADV, and Crazy Explosive Low. Dressed in black and white, the Pride sneakers feature multicolored circular patterns on the upper.